Immediately after writing a post on the train asking for your questions, I met my friend Mr. Isao Yoshino and we drove an hour to Toyota City. While on the train I realized that it had been exactly one year since my first visit to Toyota City, and my first meeting in Japan with Mr. Yoshino. The welcome sign to Toyota City as we got off the expressway. This time our destination was Toyota Memorial Hospital (TMH), for a discussion with two hospital leaders and a tour of some of the facilitates. Mr. Yoshino was there to serve as my interpreter, but as a 40-year Toyota veteran, he was also intersted in learning how Toyota’s hospital is practicing TPS. Following our 4 hours at Toyota Memorial Hospital, Yoshino and I also had time to talk in the car ride and again in his office at the end of the day before he took me back to the train station. I value our friendship tremendously and am grateful for his assistance in interpreting parts of our discussion. As Mr. Yoshino was returning me to Nagoya train station in the evening, nine hours after he picked me up in the morning, he remarked to me that “the day has gone by quickly! That’s the sign of a good day.” I couldn’t agree more. We met with Mr. Hiroya Kamada, Project General Manager of the hospital, and one of his direct reports, Mr. Takehiro Sumiya, who now leads the Customer Satisfaction Group. Mr. Kamada reports to the hospital President. He has spent most of his career in various positions in Human Resources on the manufacturing side of TMC. He was assigned to TMH just 15 months ago with the goal to bring the Toyota Production System (TPS) more deeply into the hospital. He is fluent in English having lived and worked in the U.S. and Singapore. Mr. Sumiya is a friend of a friend who I have met before, and who generously arranged today’s meeting. He has been with TMH for nearly twenty years in a variety of positions and has played a key role in bringing key concepts of TPS to the hospital. He and I are both contributors to a Japanese book in development about facilitation and leadership skills. 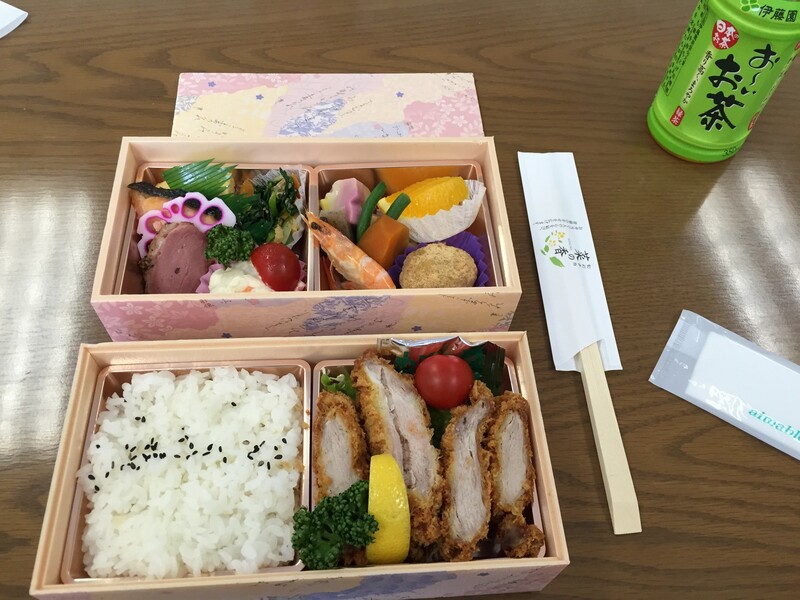 Bento lunch set – a bit different than the typical sandwiches in the United States. I want to thank them both for the time they took to share their insights and lessons about developing people, their challenges with bringing TPS into a hospital setting, and their passion for transforming healthcare. They also served a delicious bento box lunch. I have their permission to write here about our visit and conversations. Thank you as well to everyone who posed questions for me to ask during the visit – either on my blog, on LinkedIn or via Twitter. I was able to ask many of those questions, and will share the answers with you here and in future posts. I will share many of my learnings in future blog posts, but my biggest take away from our discussion with Toyota Memorial Hospital is their emphasis that TPS is primarily concerned with people, not the tools or what is necessarily easy to see with the eye. 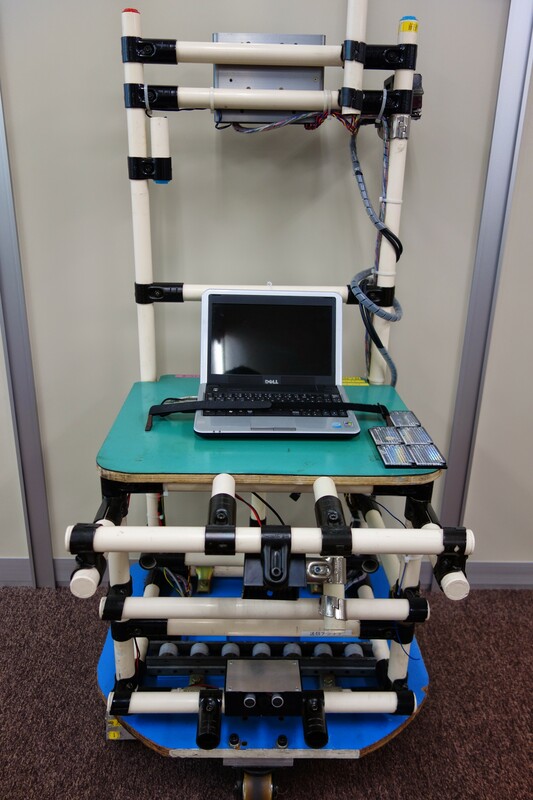 Before I can talk about the application of the Toyota Production System at Toyota Memorial Hospital, it is helpful to have come context about the organization. You can also find some history of the hospital in English on the Toyota website. Toyota Memorial Hospital is part of the Human Resources department of the Toyota Motor Corporation. 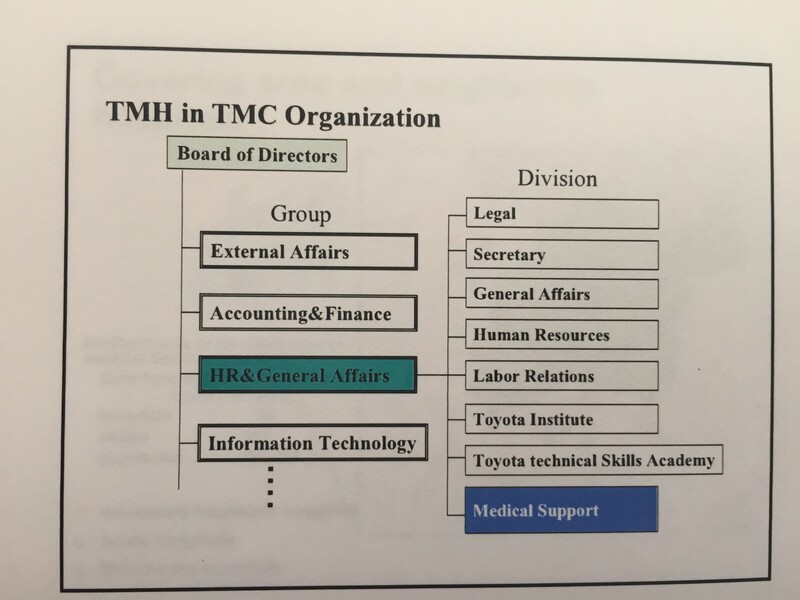 Toyota Memorial Hospital (TMH) is a for-profit hospital owned and operated by the Toyota Motor Corporation (TMC), reporting up through the Human Resources & General Affairs Group of TMC. 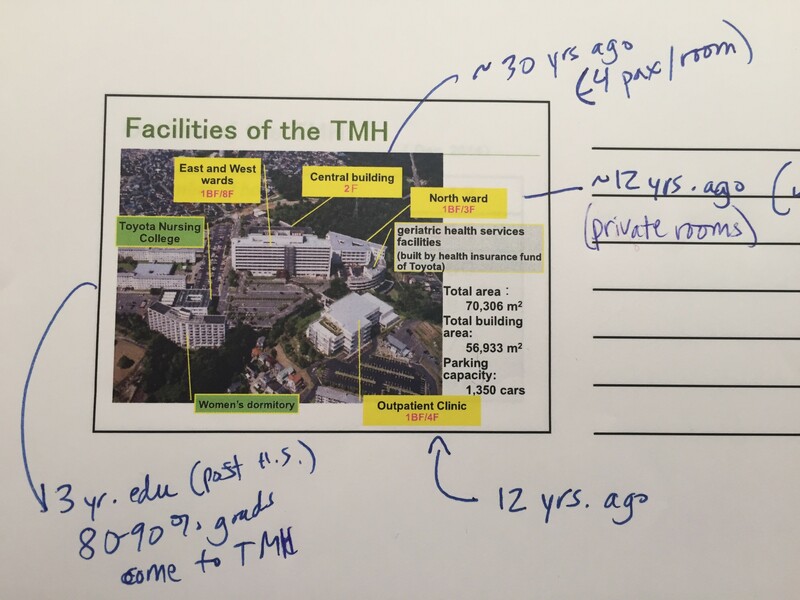 TMH reports to the HR Group because TMC considers the hospital to be a key component of creating a safe and healthy population, which is a critical service in a town where most people are employed by Toyota. I learned that only this type of company organization is rare in Japan, and that only Hitachi Corporation has a similarly run hospital. Toyota Memorial Hospital geographic coverage. Mr. Kamada indicated that, as a privately owned organization, they have more management expertise than many of the government run hospitals (which are the majority in Japan). Other Japanese healthcare leaders shared a similar perspective at the Japanese Conference for Healthcare in November 2015. Toyota Memorial Hospital has about 1,000 staff and 150 physicians, and just over 500 beds with roughly 457 inpatients per day. It is located in the heart of Toyota City and has several surrounding hospital competitors that service the broader community. Toyota Memorial Hospital consists of several facilities, including three nursing wards (two in an older building with shared rooms and a newer ward built 12 years ago with private rooms), a relatively new outpatient clinic, and a nursing college with an associated dormitory. My hosts explained that the Toyota Nursing College is one of the hospital’s strategies to manage predicted shortages of skilled healthcare workers as Japan’s population ages. The College recruits their students (primarily women) from surrounding communities following high school and puts them through a 3 year nursing education. Mr. Kamada said that over 80% of the nursing graduates come to work for TMH. 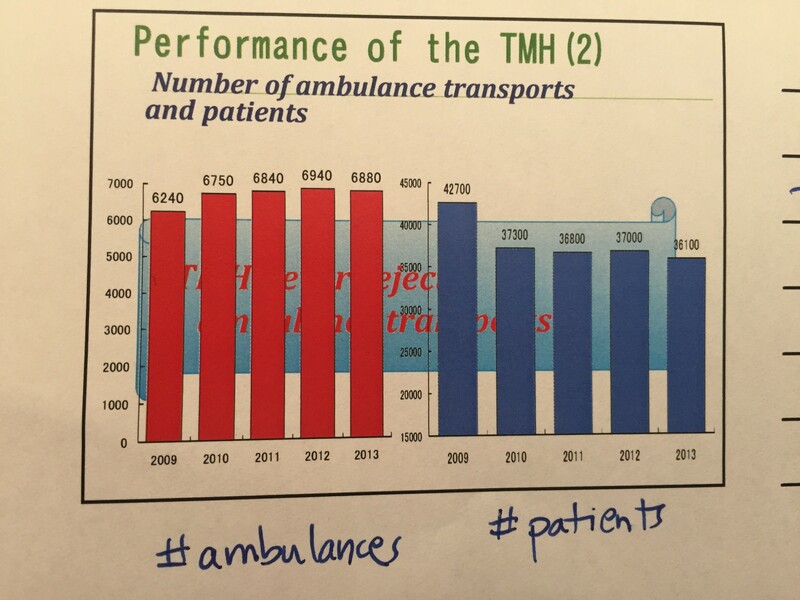 TMH never rejects ambulance transports! Mr. Kamada humbly shared that many of the hospital’s performance statistics are not where the leaders would like them to be and that they are always seeking to learn and improve. 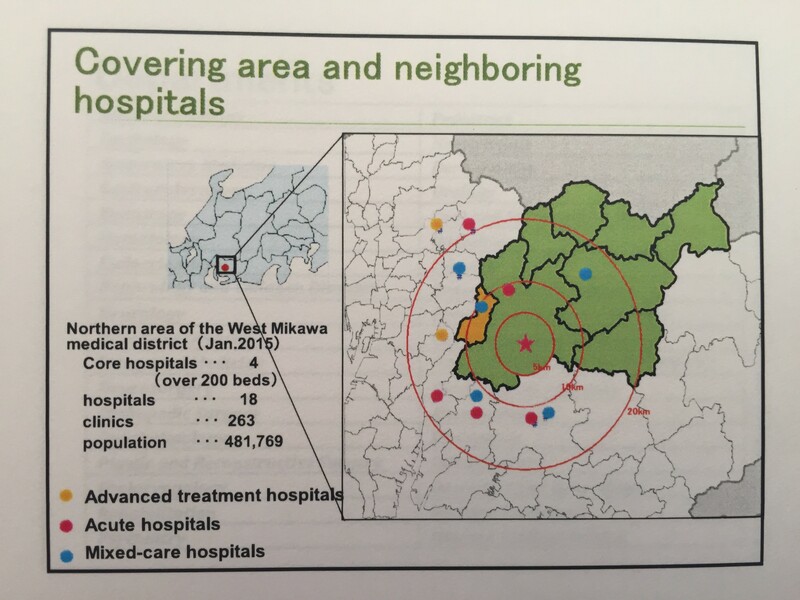 For example, he cited some of Aso Iizuka Hospital‘s better outcomes than TMH. I appreciated how he framed TMH’s opportunities and successes, that we can always strive to be better, and that there are opportunities to learn from others. One statistic that they shared as a success was their ambulance performance. Mr. Kamada said that Toyota Memorial Hospital NEVER rejects ambulance transports – and that they receive about 550 per month. I was very impressed by this, as one of my first posts about healthcare in Japan was about warnings that I had received to not call an ambulance in Tokyo as more often than not, you will be turned away by multiple hospitals. I’ve been told it is better to take a taxi and show up bloody, unless it is a serious cardiac condition or something for which the medics can assist with immediate intervention. I’m very interested in learning about how Toyota Memorial Hospital practices – or doesn’t practice – the Toyota Production System (TPS), or what we call “Lean”. How does Toyota think about the application of TPS in healthcare? 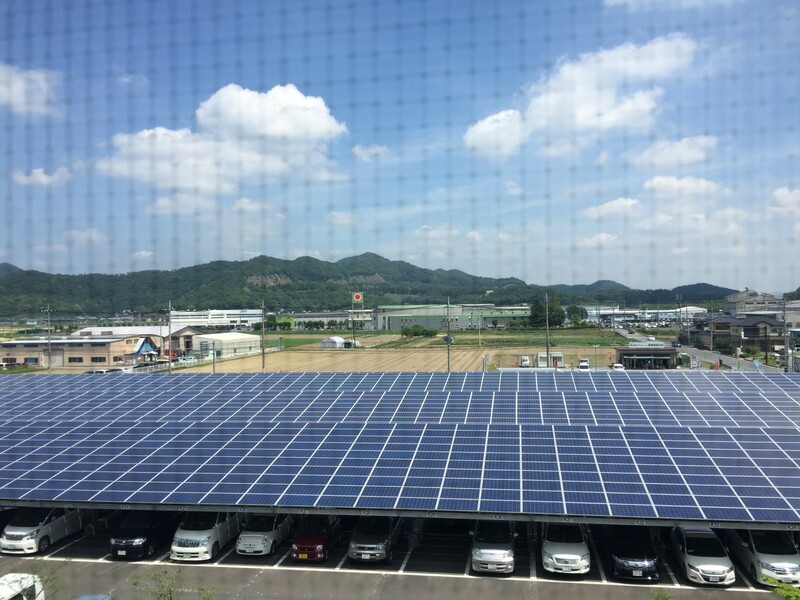 Compared to other hospitals I’ve visited in Japan, where the emphasis has been on Total Quality Management, what is the approach in Toyota City? In earlier exchanges while setting up this visit, Mr. Sumiya said many times that the hospital is not very advanced with TPS. 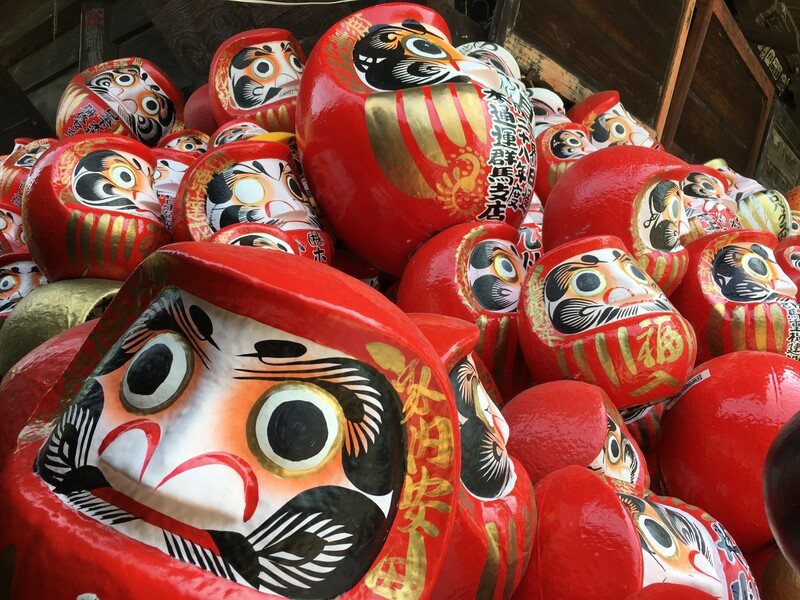 Mr. Sumiya was being humble, a quality that is valued tremendously in Japan – and even more so at Toyota – and he was also speaking the truth of Toyota Memorial’s Lean journey. It’s been a challenge to bring TPS to the hospital – even Toyota’s hospital. Based on my visit to Toyota Memorial last week, my belief is that it is is the most advanced “Lean” practicing hospital that I’ve visited or heard about in Japan. While Toyota Memorial isn’t very advanced in applying TPS compared to Toyota’s manufacturing group, nor compared with health systems in the United States (including some that I’ve helped support such as Stanford Children’s Hospital and the Palo Alto Medical Foundation) and other countries, in terms of thinking about Lean as a management system, they are further ahead than any Japanese hospitals that I’m familiar with in Japan. Earlier today I asked for the perspective of the Japanese healthcare expert who led the recent study trip by the Polish organization Langas Group that I participated in last month – and he agreed with me. In contrast, I’ve visited some Japanese hospitals that are doing great improvement work delivering quality patient care and finding ways to bring people into solving problems, such as Nerima General, St. Luke’s and Aso Iizuka. However, most of the other hospitals I’ve encountered have a focus on “Total Quality Management” (TQM) projects and methodologies, rather than a management system that focuses on developing people as part of the daily work. These hospitals may have stronger quality improvement programs, but they are programs rather than being incorporated into the way daily work is done. How long has the hospital been practicing TPS? It doesn’t seem that there was an official “start date” when Toyota Memorial Hospital began practicing TPS. Rather, it has been an ongoing evolution with bits and pieces brought in over time, with a renewed focus on deepening TPS practices in the past 15 months. On this visit, I learned that the hospital has been practicing hoshin kanri (strategy deployment) for about 10 years and that they have a front-line kaizen (continuous improvement) process that generates 600-700 local improvement ideas each year. Plus, they had the best-looking stock room (clear practice of 5S and a paper kanban system) of any of the other three Japanese hospitals that I’ve visited. I’ll write in more detail about these three topics in a future post about the continuous improvement side of the Toyota Way at TMH. What influence has Toyota Motor Corporation had on the hospital’s practice of TPS? 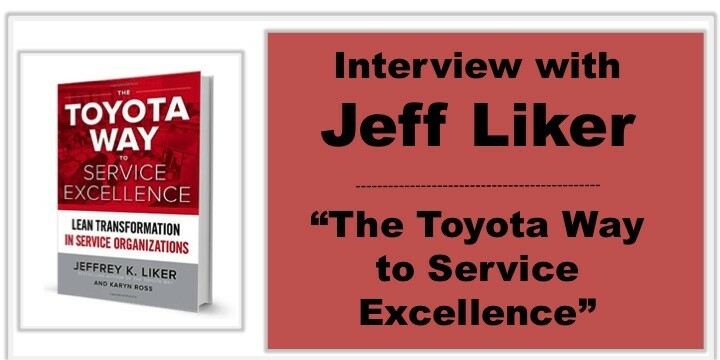 My impression is that Toyota headquarters has been helping the hospital leaders learn the Toyota Production System both indirectly and directly. Thank you to Mark Graban for this question as well as about how long TPS has been practiced. 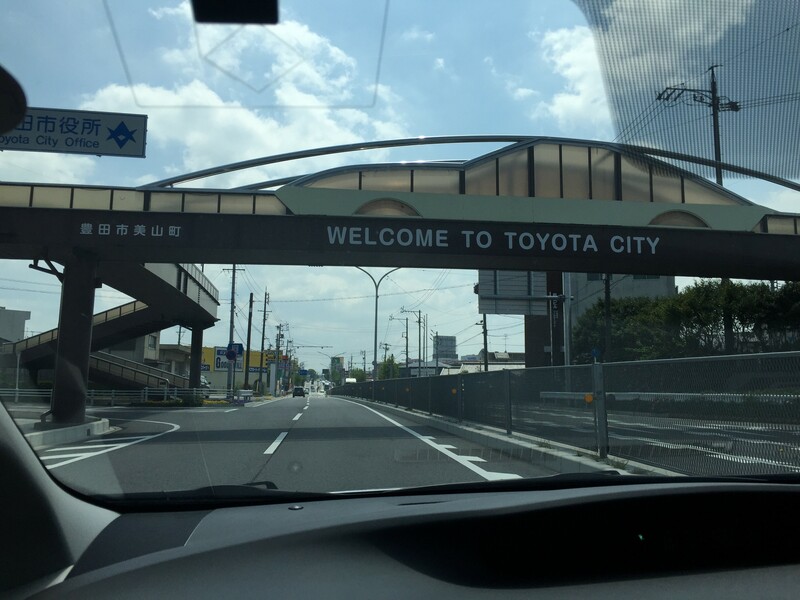 Given that most of the community in Toyota City is connected with Toyota Motor Corporation in some capacity, it seems natural that there would be indirect influence on the leaders’, doctors’ and employees’ mindset and awareness of TPS. For example, Mr. Kamada shared that the President of the hospital was the primary physician for one of the Toyoda family members – who influenced his thinking about the importance of TPS and senior leadership. While TMH has the same policies and operational procedures as Toyota Motor Corporation, policies and procedures don’t necessarily translate into practice. The most direct help that TMC has made in imbedding TPS in the hospital culture has been through the deployment of the Mr. Kamada to the hospital, reporting to the President. He was sent from Toyota HQ’s HR department about 15 months ago with the goal of accelerating the practice of TPS. Mr. Syumiya said that he has observed clear deepening of TPS practices and traction since Mr. Kamada joined the hospital leadership team. So HOW is the Toyota Production System being practiced and developed? 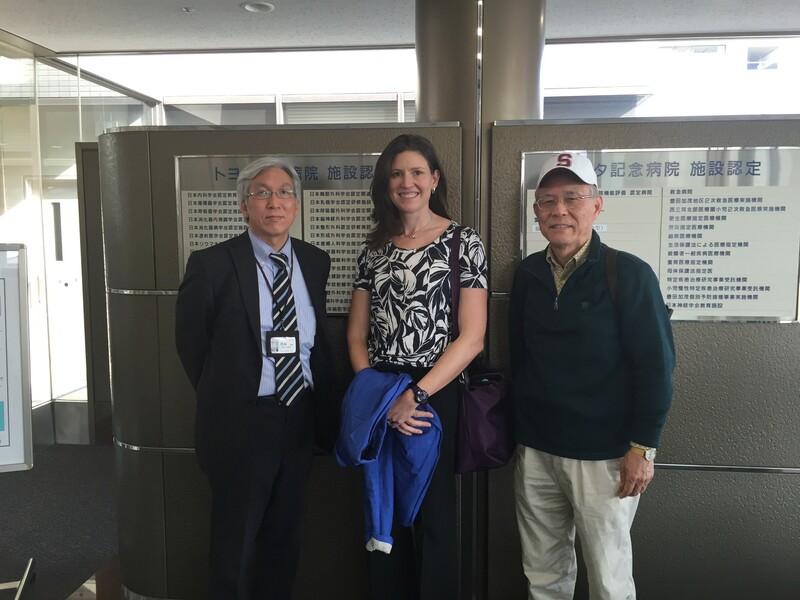 I asked Mr. Kamada several times about how he is deepening TPS practices in the hospital. His response: “this is my challenge!” But start with the people. It’s reassuring for all of us to know that no matter if we work for Toyota or Toyota’s hospital, TPS isn’t easy to do and is a challenge! It is clear from him that leading with people is the most important. Stay tuned for my next post to learn more. For now, I want to leave you with my reflection that it is what we do to develop people that is the most important – regardless of industry and regardless of what you call it (Lean, TPS, or just good leadership). It is this thought from last week that influenced my post over the weekend – “Coaching for Improvement: not just Lean, Toyota, or Silicon Valley methods…just good leadership”. I will reflect more on my day at Toyota Memorial Hospital and share more insights with you in future posts about: the importance of people in the Toyota Way, my tour of the hospital (including evidence of production principles such as 5S), the hospitals practice of hoshin-kanri and kaizen, how they engage patients in improvement, and more of your questions answered. I welcome your thoughts and reflections below. If you aren’t already subscribed, sign up below so you don’t miss out on my future posts about my visit to Toyota Memorial Hospital, my reflections on visiting Toto and AVEX Industries last month, and musings about leadership, Lean and life in Japan!